One woman’s dream of selling her home and relocating became a nightmare when she received shocking news about the property from her realtor. Apparently, squatters had taken over her home just days before the closing process was finalized. According to KRDO, Pauline Hawkins had relocated to New Hampshire and was awaiting the sale of her home in Colorado Springs, Colorado. However, her real estate agent wasn’t the only person who listed the home. She later learned the home was listed on a rental site by a fake landlord. After the couple paid the scamming landlord $2,700 to rent the home, he took their money and disappeared. Surprisingly, Hawkins sympathized with the family and was even nice enough to let them stay for the holidays since the incident took place so close to the Christmas. She recently recounted the series of events that led to the decision she’d later regret with KRDO. But, unfortunately, her kindness was taken for weakness, because now she can’t get rid of them! Then, to make matters worse, squatting isn’t all they’ve done. Based on their actions, they’ve literally moved in and taken over. 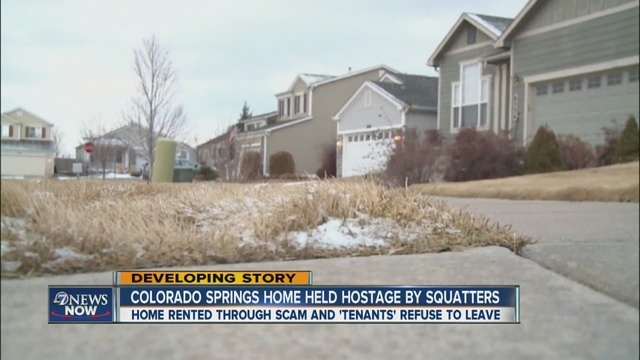 The news outlet reports that the squatters’ cars are parked in the garage, their children play in the backyard, and they even have mail and packages delivered to the home as if they’ve obtained legal ownership of the property. They’ve definitely made it quite clear that they have no intentions of leaving. As a matter of fact, it’s been almost two months and they still refuse to leave. But, that’s not all. The couple has reportedly trashed the home, which caused the sale to fall through. “They destroyed my house so much so that when the buyer went through the final walk through, took the offer off the table,” said Hawkins. The squatters’ actions have also halted the selling process because Hawkins is unable to show the home because the squatters are there. Her real estate agent, Linda Schauer, also voiced her concerns and frustrations about the daunting ordeal. According to the Denver Channel, Hawkins is facing an uphill battle because the Colorado Springs Police Department refuses to intervene on her behalf. Since the situation is considered a civil matter, there is actually nothing they can do to force the family to leave the home. Hawkins has also shared her sentiments of the grave inconvenience the squatters have caused. She also expressed how she feels about the housing laws, or lack thereof, in reference to this type of situation. She reportedly planned to use the funds from the sale of her home to pay her son’s medical bills. He was reportedly diagnosed with a rare form of brain cancer. Now, in addition to his medical expenses, she will be incurring court costs because she’ll have to have the squatters evicted. Do you agree or disagree with the civil laws that protect squatters? Share your thoughts.